The skeletons of pterosaurs are our primary evidence into their structure and lifestyle. Most specimens are known only from skeletal material, though a few have some soft tissue impressions (mostly in the form of crests and wings). Figure 1: the skeleton of Anhanguera piscator. The bones of pterosaurs are often very thin-walled, as well. That is, many of the bones are quite hollow, with most of the internal volume filled with air. Early pterosaurs had reasonably “average” bones, but most of the later species, especially the giants, had bones with incredibly thin walls and numerous internal bony struts to counter buckling. This thin-walled architecture has led to the common misconception that pterosaur skeletons were extremely lightweight. This myth fails to take into account the overall volume of the bones, which is actually quite large. The same trend (and associated misconception) applies to birds: many species have very hollow bones with air sacs inside (these connect to the respiratory tract), and yet the skeleton of a bird weighs the same as that of a mammal of the same total weight. In both birds and pterosaurs the thin walls of the bones act to increase the strength of the skeleton without adding additional weight. The space for attaching muscles is also greatly increased, which is important for an animal that needs a great deal of power (as flying animals do). This is a subtle, but important, difference from what is typically stated about pterosaur skeletons. In particular, it debunks the common perception that pterosaurs were ultralight, frail animals akin to a wire-frame hang-glider. This is discussed further in the section on “Life in the Air”. There were two major bones in the chest that anchored most of the flight muscles. The first was the sternum, which is the breastbone in birds and the front plate of our chest. The second was the pair of scapulocoracoids, which were single bones made from the fusion of the shoulder blade (scapula) and coracoid on each side (we do not have a coracoid bone, but it was a broad plate that formed part of the shoulder in pterosaurs). Figure 2: Potential membrane extents in pterosaurs. Current evidence suggests that a membrane completely free of the hindlimb was unlikely. An anterior-facing pteroid has also been rendered unlikely based on recent biomechanical analysis demonstrating that the loading in such a configuration would cause the pteroid to fail. Reconstructing how an animal breathes from fossil bones is not an easy task, but we do have many clues for pterosaurs. Because some of the bones were hollow in many (if not most) species, we know that the respiratory tract had air sacs connected to it. The particular interlocking of the ribs and sternum in the chest suggest that they moved in a manner similar to the chest motion of birds. Taken together, these factors indicate that pterosaurs probably had a lung system much like birds, which is highly efficient. It would mean that pterosaurs probably lacked a diaphragm (which we use as our primary breathing muscle), and that they likely used a complex pulsing motion of the sternum and chest wall to work their breathing. It is quite possible that the largest pterosaurs used a large amount of what is called ‘anaerobic power’. That is, much of their muscle mass may have been very high-power fibers, that do not use oxygen to generate force, but tire very quickly. This is expected both from the requirements of large flying animals, and from the observation that the neck is proportionately huge compared to the chest in some large pterosaurs (which would create a very large amount of “dead” air space compared to the air passing through the lungs at any given moment). The pterosaur wing was unique. The main surface was a membranous structure, made up of muscle, skin, blood vessels and stiffening fibers. The wing was suspended mostly from a hugely expanded fourth finger, as well as the rest of the forelimb (Fig. 1). For many years, it has been debated whether or not the wing ran to the body alone, or also to the legs. Thanks to the discovery of wonderful fossils with soft tissue impressions from several sites around the world, we now know that at least some pterosaurs (probably most) had a wing that attached to the hind limbs (Fig. 2). Currently, there are no specimens that clearly show an attachment free of the hindlimb. We also know that most of the wing was quite narrow, however, so the wing may have turned towards the hind limb at a rather sharp angle. 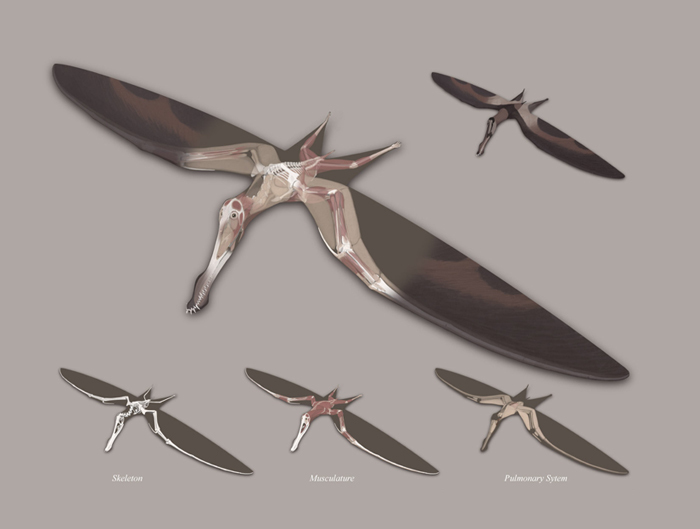 The parts of the pterosaur wing, and their use in flight, are detailed in Life in the Air. Most pterosaur fossils do not preserve skin or other aspects of integument in much detail. However, there are some pterosaurs specimens that do preserve impressions of body coverings. From such specimens, we know that pterosaurs were partially covered by hair-like projections, now called pycnofibres, that would have given them a somewhat hairy or furry appearance across at least some of their body. Some specimens, such as the anurognathid pterosaur Jeholopterus seem to have been particular well endowed with pycnofibre "fur". While the full range of functions and effects yielded by such coverings is difficult to gauge, it is likely that they served, in part, to provide insulation, which provides additional evidence that pterosaurs utilized rapid metabolic rates. Pterosaur reconstructions regular depict an emaciated appearance, as if skin were barely stretched over bone. Indeed, some of the early weight estimates for large pterosaurs, especially, took this "ultralight" paradigm to the extreme. In reality, however, work since the late 1970's (such as that by Prange) has shown that the relationship between bony mass and muscle mass is remarkably consistent across a wide variety of terrestrial vertebrates. Furthermore, recent quantitative mass estimates of pterosaurs show them to have been much heavier than early accounts, and detailed muscle maps similarly indicate that pterosaurs most likely carried a heavy mass of muscle, comparable in overall fractions to that of living birds and mammals. Interestingly, however, because pterosaurs were proportioned such that the limbs were disproportionately large, the relative muscle fraction associated with locomotor elements (i.e. wings and hind limbs) was comparatively enlarged (Figure 3). The physiology of pterosaur muscle is more difficult to assess, of course, as none of the original material survives. However, there are known trends in the power output and muscle fiber composition within flying animals that can be used to make estimates. It has been known since the mid 1990's that there is a highly predictable trend in anaerobic fiber composition as body size increases in flying animals: large flyers have proportionately more "fast-twitch" fiber (anaerobic) than small flying animals. For smaller pterosaurs, this means we can expect about the same proportion of aerobic fibers as similarly-massed birds, roughly speaking, while the giants (such as Quetzalcoatlus) should have had mostly fast twitch flight muscle. There is some slosh in the trend, of course, but we can use known aspects of morphology and estimates of behavior to help pin down estimates. Animals that fly through continuous flapping, for example, carry more aerobic muscle than anaerobic muscle (this means, for example, that small pterosaurs munching insects on the wing would probably carry mostly aerobic muscle - they would be both small and continuously flapping for long periods of time). Soaring forms, on the other hand, only flap for short bursts, and pack their muscles mostly with anaerobic fibers. Anaerobic muscle produces much greater power output than aerobic muscle, but tires more quickly. Over a short burst, however, anaerobic muscle can make a huge difference. In living birds, for example, aerobic capacity tops out around 175 Watts/kg of muscle, but fast twitch fibers in birds can put out 390 Watts/kg. Crocodilians and squamates can get even more power from their fast-twitch fibers. An additional effect is power magnification. Power magnification is an important trait in animal systems that allows them to produce much higher power outputs than normal for short periods of time. There are several mechanisms for power magnification, but many of them work off of a general principle of "slow in, fast out": energy is stored relatively slowly (perhaps over multiple seconds) and then released very quickly (over a small fraction of a second), with the effect being that the output power during the burst is enormous. During flapping flight, only relatively modest power magnification was available to pterosaurs, but there is morphological evidence that pterosaurs utilized substantial power magnification during launch and wing opening. Based on reconstructions of tendon attachment points in pterosaurs, it is likely that some species (perhaps most) used a lock-and-release system on a flexor tendon cross the wing finger pivot - such a system is called a catapult mechanism (Figure 4). Since traces of the fourth metacarpal are only seen in trackways occasionally, it is likely that the wing finger pivot joint was typically only pressed against the substrate briefly, during takeoff (trackway evidence will be required to confirm or refute this possibility - but structural reinforcement of the wing finger joint does indicate substantial terrestrial loading). Many living leapers have some form of catapult mechanisms to allow power magnification during jumping. Research is still ongoing regarding the potential for power magnification in pterosaurs, but some estimates place the maximum instantaneous power output of a leaping azhdarchid at over 70,000 Watts. 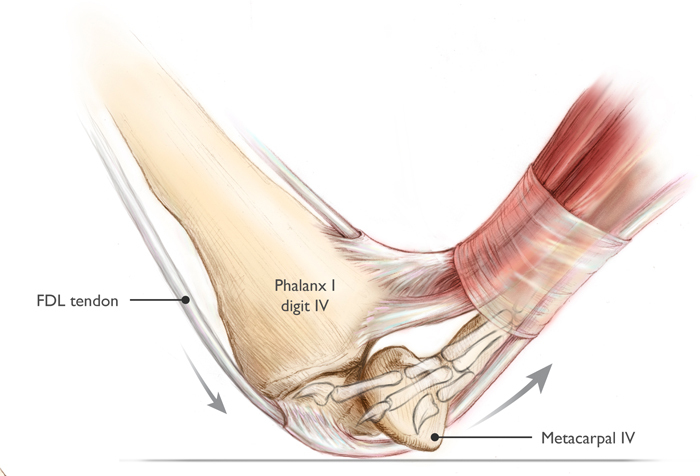 Figure 4: Catapult mechanism in flexor tendons and fourth metacarpophalangeal joint, by Julia Molnar. The FDL tendon, pinned to the ground during stance phase, slides through the groove in metacarpal IV when the animal vaults, which releases stored energy suddenly. This greatly increases power output.